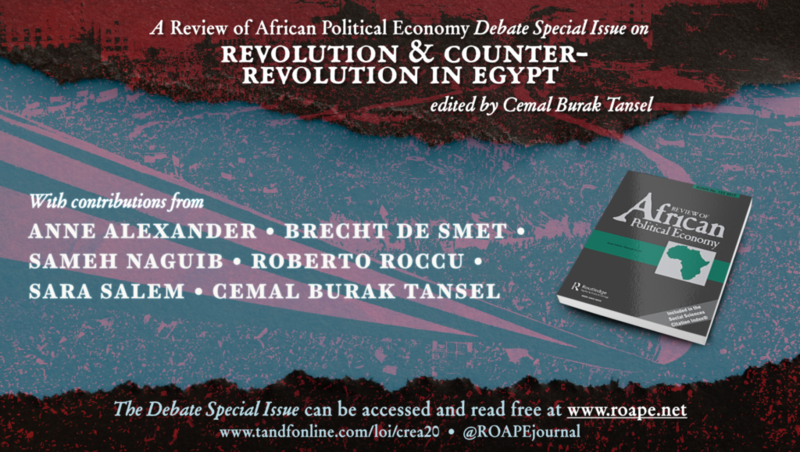 In this blogpost Cemal Burak Tansel and Brecht De Smet introduce a ROAPE Debate Special Issue on the Egyptian revolution. They discuss the ideas of the Italian Marxist Antonio Gramsci and their relevance to revolution and counter-revolution in North Africa. The Special Issue, edited by Cemal Burak Tansel, brings together a range of leading researchers and activists to debate the process of revolution and counter-revolution, the agency of ‘the people’ and of the ruling classes in times of popular revolt. roape.net readers can access the articles for free by logging-in / registering here. The financial crisis of 2008, the rise of right-wing ‘populism’ in Western Europe and the US, the Arab uprisings and new forms of local and global (intersectional) struggles indicate that the ‘neoliberal’ variant of capitalism is at a crossroads. The financial meltdown has revealed the structural instabilities of deregulated capital flows, while the tendency toward increased authoritarianism and obsession with security shows the limits of the institutions of bourgeois democracy to absorb mass discontent. At the same time, episodes such as the ‘Arab Spring’ sharply state the relevance of categories such as revolution and counter-revolution for the 21st century. The revolutionary uprisings, first in Tunisia and then in regional heavyweight Egypt, reinvigorated mass emancipatory politics throughout the Middle East and the world at large. Movements such as Indignados, Occupy Wall Street and Gezi Park protests in Turkey were directly inspired by the apparent success of the Tahrir occupation, which offered a powerful, contemporary form of popular revolution. Tahrir came to represent the potential for a global rupture of capitalism. Yet by the end of 2013 the outcomes of the Egyptian uprising had already proved disappointing. The military, bureaucratic, and security elites from the Mubarak era—the so-called ‘deep state’—were able to hold onto state power. Despite the fall of a dictator, the political and economic structures remained unchanged. After two years the counter-revolution was successful, not despite the mobilisation of the masses, but because of it. The current strongman, president Abdel Fattah al-Sisi, came to power through a clever and agile appropriation of the grassroots Tamarod (Rebel) campaign, which rallied hundreds of thousands, if not millions of ordinary Egyptians in the streets. The Egyptian experience raises fundamental questions about the process of revolution and counter-revolution, about the agency of ‘the people’ and of the ruling classes in times of revolt, and about the nature of state power in an era of global crisis. In our Debate Special Issue: Revolution and Counter-revolution in Egypt, we address these issues through an extensive engagement with the thought of Antonio Gramsci and recent contributions to the literature on contemporary Egypt, Marxist theory and the broader questions of development, emancipation and revolutionary political practice. While the contributions to the symposium focus largely on Brecht de Smet’s book Gramsci on Tahrir, the approach and key arguments of the book are also contrasted with relevant contemporary texts, such as Gilbert Achcar’s The People Want, Maha Abdelrahman’s Egypt’s Long Revolution and Anne Alexander and Mostafa Bassiouny’s Bread, Freedom, Social Justice. The symposium thus aims not only to assess the recent scholarship on the Egyptian revolution, but also to contextualise the theoretical and political questions posed by the book and their relevance to the wider Global South-oriented interdisciplinary debates. A central figure and conceptual resource that cross-cuts all contributions in the symposium is Antonio Gramsci (1891–1937). Gramsci has been one of the most influential Marxist thinkers and his ideas have been appropriated by different disciplines within the critical social sciences, ranging from political theory, postcolonial and cultural studies to international political economy. Due to the fragmentary nature of his main writings collected in the Prison Notebooks, his thought has been interpreted in varying and even contradictory ways, leading to the emergence of what Roberto Roccu called a ‘prêt-à-porter version of Gramsci.’ For some, the figure of Gramsci has become a hand puppet, mouthing scholars’ own theories through the open text of the Prison Notebooks. For example, Perry Anderson and Alex Callinicos have argued that contradictory interpretations of the notions of respectively hegemony and passive revolution arise directly from inconsistencies and ‘concept-stretching’ within the Prison Notebooks themselves. Nevertheless, Gramsci indicates that there is a coherent leitmotiv or ‘rhythm of thought’ operating throughout the Prison Notebooks that transcends its scattered character. In the past decade new scholarship such as Adam David Morton’s Unravelling Gramsci and Peter Thomas’s The Gramscian Moment has reasserted not only the internal consistency of Gramsci’s thought, but also its relevance for our understandings of crisis, struggle, and transformation within contemporary global capitalism. Gramsci on Tahrir inscribes itself within this tradition, critically deploying Gramsci’s ideas to comprehend the process of revolution and counter-revolution in Egypt and its relation to the broad historical development of capitalism. Conversely, the Egyptian experience serves as an interlocutor of Gramsci’s ideas. De Smet defends the necessity for permanent revolution by arguing that the idea of a purely democratic transformation of the régime on a (neoliberal) capitalist base is deeply flawed. Drawing on the concept of uneven and combined development De Smet combines the insights of Achcar’s The People Want and Hanieh’s Lineages of Revolt. Achcar’s point of departure is the particularity of the region, and especially its long history of ‘fettered development’ which leads him to emphasise the Middle East and North Africa’s (MENA) specific political and economic trajectory, a trajectory defined by state of permanent crisis. For Achcar the ‘peculiar modality’ of capitalism in the MENA is the patrimonial rentier state and neoliberalism merely represents a new layer of oppression and exploitation to this historical set-up, channeling public resources more decisively in the hands of a select group of oligarchs. Hanieh, on the other hand, examines the Egyptian case from a decisively global perspective and takes into account the internationalisation of capital, class, and state and—following Lenin—the role of imperialism as a geopolitical, military, and economic force. Hanieh points toward the convergence of different fractions of capital, highlighting the connection between global, regional, and national ebbs and flows of accumulation. In Hanieh’s account, instead of representing a new layer on top of an existing regime, neoliberal accumulation is understood as a process that has fundamentally restructured the nature of state and class in the region—and in the Global South in general. De Smet integrates both perspectives by embedding Egypt’s particular trajectory within the world-historical process of uneven and combined global capitalist development, crisis, and (passive-) revolutionary transformation. This view allows him to explore populist and authoritarian tendencies in the West as well, which are understood as varying articulations of a general crisis of neoliberal accumulation and hegemony in line with the emergent scholarship on authoritarian neoliberalism. Gramsci on Tahrir positions itself within the existing literature on the Egyptian revolution among those works that are sympathetic to the emancipatory movement of workers, peasants, women, the urban poor, and other subaltern groups. Instead of evaluating the revolutionary process merely on the basis of its outcomes, De Smet insists on understanding the revolution as a process of class and popular subject formation, intersected by ruling classes’ strategies of repression, deflection, and cooptation. Roberto Roccu’s contribution to the Special Issue considerably expands De Smet’s take on subaltern subject formation, questioning the possibility of a broad alliance between subaltern actors in the Egyptian context. The book’s conceptual infrastructure, in which concepts such as passive revolution function as exploratory searchlights to reveal tendencies within the process of revolution and counter-revolution, has been a contested topic of debate. In addition the contributions of Anne Alexander and Sameh Naguib and Cemal Burak Tansel in the Special Issue critically engage with De Smet’s understanding and deployment of passive revolution and Caesarism, drawing on their extensive knowledge of, respectively, the Egyptian and Ottoman/Turkish historical trajectories. Both the innovative ideas formulated in Gramsci on Tahrir and their criticisms offer an important contribution to the studies of revolution and restoration. The book and our individual contributions in this ROAPE Debate Special Issue emphasise the importance of understanding the ‘Arab Spring’ as a long-term process of revolution and counter-revolution within a broader political-geographical and historical context. This is also the approach taken by Sara Salem in the issue. Salem critically explores De Smet’s use of the concept of passive revolution through an insightful discussion of the continuities and discontinuities within Egypt’s modern trajectory of socio-economic development and state formation. The Special Issue is concluded by a detailed rejoinder by De Smet, which addresses the issues raised by the contributors and restates the significance of utilising Marxist methodologies in studying socio-economic and political change in the peripheries of global capitalism. Notwithstanding certain differences in our conceptual and political analyses, we hope that the ROAPE Debate Special Issue will be read as a demonstration of the vibrancy of Marxist approaches. Egypt’s revolutionary upheaval might have been swallowed by the authoritarian restoration of its ancien régime, but the struggles to build on and realise the emancipatory lessons of Tahrir continue. We present this Special Issue as a modest contribution to support those efforts. Cemal Burak Tansel is Lecturer in International Politics in the Department of Politics at the University of Sheffield. Brecht De Smet is a Post-doctoral Lecturer and Researcher in the Department of Conflict and Development Studies, Ghent University. Featured photograph: Egyptian revolution (Day 16) 9 February, 2011.